Your rainwater tank is a key piece in your rainwater harvesting system, but it is one of many when it comes to delivering quality water into your home. There are various components (accessories) to the system to consider that can affect your water quality, how the water is distributed around your home and the amount of manual effort required to maintain your system. This article identifies the important components of an effective rainwater harvesting system and things to consider when planning the integration of each component into your property. If your home is in an area surrounding by bush or trees, then investing in gutter screens might be good to prevent leaves and debris from building up and blocking your gutters. It is obviously important that rainwater can freely flow into your downpipes and end up in your tank. Screening your gutters is a great way to stop your gutters becoming clogged. They are recommended if leaves regularly fall on your roof. If installed yourself, an average home can be setup with high-grade plastic gutter meshing for less than $500. Rain heads, also known as leaf eaters, deflect leaves and debris away from the entry to pipes that carry water. They are generally installed just below your gutter downpipe, at the top of the pipework that directs rainwater into your tank. Unlike gutter guards, the main purpose of which is to screen out leaves, you want to ensure mosquitoes, small insects and rodents don’t make their way into the pipes leading to your tank. We recommend stainless steel screens with an aperture size of 1mm or less as the only option you should consider for a rain head. Such are durable and will stop creatures getting into the pipes. Where the rainwater leaves pipework and enters through the opening into your tank, it is important to install tank screening to ensure mosquitoes, insects and debris don’t find their way into your tank. This screening is firmly affixed to the top of your tank, or is affixed to the top of your water diverter (if purchasing Team Poly’s self-contained water diverter solution). Many councils require you to install water diverters when your tank water is plumbing into your home. When it starts to rain, the first drops of rainwater that hit your roof will often contain dust and debris. It would be great to divert and flush this dirty water away from your tank, which is the exact function “water diverters” serve. There are a variety of water diverters available today. Some come as a basic kit, which require you to purchase separate piping when installing. 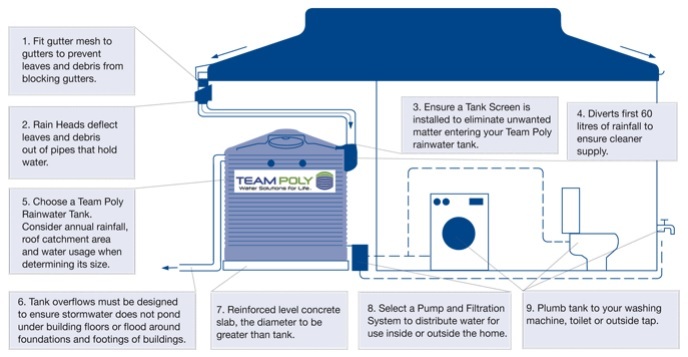 Team Poly provide an easier custom water divertor solution. Our water diverters are easily affixed to the top of your tank and require no additional piping. They capture 60 litres of the “first flush” of rainwater, have a built-in filter and help greatly increase the quality of water flowing into your water tank. You will obviously need a container to store your rainwater in, and this is where the humble rainwater tank enters into your system. When selecting appropriate rainwater storage, you will first need to decide how much rainwater you can capture and need to store. Second, you will need identify an appropriate site on your property to install your water tank, or perhaps multiple tanks which can be a better solution for some. Once your water storage tank/s are full, excess water needs to be able to flow out. For this reason, rainwater tanks have a hole at the top where overflow piping is connected to lead any excess water away, normally into stormwater drainage. It is important to ensure that the overflow directs water away from your tank to avoid undermining its foundations. Also, divert the water away from buildings and other structures. Sometimes people design their gardens to effectively soak up excess rainwater, other times having a separate “stormwater detention” tank where excess rainwater is directed into is a solution encouraged by many councils to help with stormwater runoff. Since your tank overflow creates a point of entry for insects to get into your tank, it is important to screen your tank overflow. For this, Team Poly sell an overflow strainer and elbow pipe. Correct site preparation is essential to ensuring a long and trouble-free life for your rainwater tank. You will need to setup a solid, level and compacted foundations for your tank. Team Poly recommend foundations extend 150mm beyond your tank diameter. Suitable bases include brick, concrete, gravel or solid dolomite surface between 300mm and 400mm in depth. If you will use tank water throughout your property, then you will need a pump to get your water to where it needs to be. Filtration should also be installed as appropriate to your needs, especially if drinking or using your rainwater in cooking. The power of your pump is generally determined by the number of points you will access your tank water from throughout your property. Team Poly can recommend and provide the right water pump to suit your needs. Your tank should only be installed by a qualified plumber in accordance with your local council regulations. At the base of your tank is where your valve is affixed, which is in turn connected to flexible piping (to absorb shocks and any movement) that is then connected to the pipework that leads to your existing plumbing. If plumbing-in your tank you will need to decide where you wish you would use your tank water. Common areas of use include washing clothes, toilet flushing and outdoor taps where hoses can be connected to water gardens or wash cars. It is important to keep in mind that while rainwater can be safely consumed, government and health organisations generally recommended that you use a reticulated mains water source for drinking and cooking purposes where one exists. So if you will be using it in the kitchen and for bathing, then you will need to ensure your tank water is properly maintained and appropriate filtration is installed. To ensure water will always be available, we finally recommend also installing a rainwater to mains water backup system.